Clarets boss Sean Dyche feels his squad can only get better – but more competition will benefit everyone. 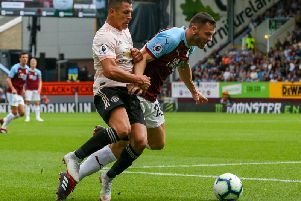 With less than a fortnight to the first game of the Premier League season, Burnley have made only two summer signings, Johann Berg Gudmundsson and Nick Pope, both from Charlton Athletic. Dyche remains keen to further bolster his group, who maintained their unbeaten pre-season schedule with an impressive 3-1 win against Rangers at Ibrox on Saturday. Burnley have had offers for Derby County’s Jeff Hendrick and Brighton’s Dale Stephens rebuffed so far, while stories in the national media on Saturday suggesting they have had a £5m bid for Sheffield Wednesday centre back Tom Lees are wide of the mark. Liverpool full back Jon Flanagan could potentially tie up a season-long loan yet, while a report in Holland on Friday claimed the Clarets are keen on Twente’s Moroccan playmaker Hakim Ziyech, but face competition from Roma. Dyche said of his current squad: “You’ve seen that we’ve got a group that will give you everything and they’re still learning, there’s still things that we can add. “They’re a really good group. They’ve taken us a long way over the last three years. “There’s some new additions, of course, but there’s still a bulk of the players who have been there for the whole journey. “So it’s about adding that competitive element that gives them another push forward and also, if you can get quality that you feel is better, that’s a given. “It’s not about necessarily replacing, it’s about adding to the quality to enhance everyone. It makes everyone step forward, it makes everyone push themselves. But finding the finance to persuade clubs to sell and players to move, even with a record TV deal, is proving difficult: “We’re in there and a lot was made of that and we’re in there and we get finance.